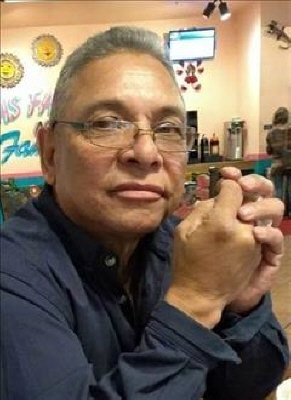 Pedro Soliz, 68, passed away March 27, 2019. Funeral service will be 10:00 AM, Saturday March 30, 2019 at Abilene Funeral Home Chapel of Hope with Pastor Juan Valdez officiating. Burial will follow at Abilene Municipal Cemetery, directed by Abilene Funeral Home. Mr. Soliz was born April 12, 1950, in Plainview, Texas to Pedro and Antonia Soliz. Mr. Soliz was preceded in death by his parents, three sisters: Elsa Aguirre, Julia Sepeda, and Gloria Lambert; brothers: Paul Soliz Sr. and Ruben Soliz. Survivors include his loving wife Petra Soliz of Abilene; sons: Stephen Soliz of Abilene, Daniel Soliz of Anson; daughters: Bianca and husband Jesus Chacon of Abilene, Sherry Ann Martin of New York; brothers: John and wife Ester Soliz, Felix and wife Juanita Soliz, Raul soliz, Joe and wife Olga Soliz all of Abilene; sister Ruby Rivera of Rotan, and nine grandchildren. Pallbearers will be Jessie Chacon, Zack Soliz, Felix Soliz Jr., Paul Soliz Jr., Sunny Soliz, and Roy Soliz Jr.. The family will receive friends at a visitation from 6:00 PM - 8:00 PM, Friday, March 29th, 2019 at Abilene Funeral Home Chapel of Hope. To send flowers or a remembrance gift to the family of Pedro Soliz, please visit our Tribute Store. "Email Address" would like to share the life celebration of Pedro Soliz. Click on the "link" to go to share a favorite memory or leave a condolence message for the family.